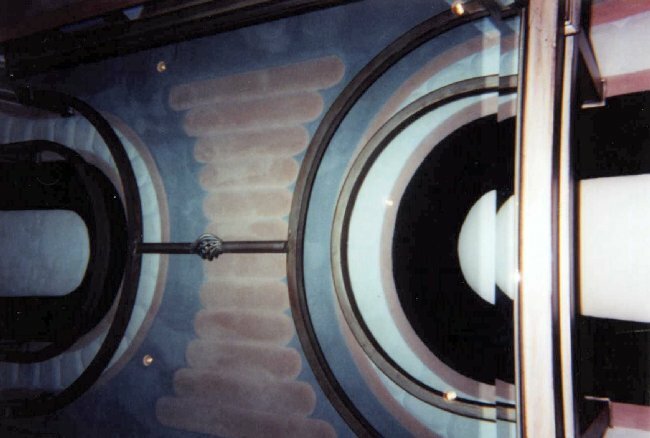 If you are looking for information on the Corian and Wall carvings, please go here: Wall Sculpture. Designers and Architects, if you are looking for an excellent collaborative relationship on a particular job, look no further. Gino has worked with many Designers and Architects through the years. With extreme respect and professionlism towards you and your client, Gino will help bring together the sales aspect of your job. Whether you already have a design you&apos;d like Gino to create to full scale, or would like to collaborate on a custom area rug work, please feel free to call Him with any details or questions you may have. As mentioned on the Getting Started page, Gino begins with measurements and colors, noticing the architecture of the room and the furniture/styles and tastes of the home, just as you do as a Designer. Or perhaps it was your design to begin with. Should the two of you decide upon a collaboration, be assured that you are in charge of the works that progress. You set the appointment(s) that you and Gino will attend together. In this manner Gino can do his measuring and take in any mental detailed artistic notes he feels relevant to the end design. He will take into account you and the client&apos;s input and then begin creating the custom area rugs you and your client had in mind. 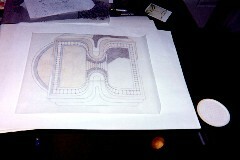 The drawings should take anywhere between 1 and 3 weeks to complete. You remain in charge of your job, the pricing, and delivery schedule. Gino will never contact your client. Instead, should he have a question he'll go directly to you. 99 percent of the time, the initial meeting will be all Gino needs to begin the process of drawing out the custom designed area rugs in question. Just as Gino will do the scale renderings, he will also then create a cut list so that the least amount of carpet can be purchased from the factory in order to fabricate the custom area rugs. Being a Designer or Architect, you are already aware of the way carpet is ordered from the factory. In widths of 12 feet to 13 feet, and linear feet in length. (i.e. : 2 foot by 12 foot) This becomes important price-wise when ordering pieces that will become the various colors in the rug. Companies like Fabrica charge $50.00 and upwards for a carpet cut under 10 feet. Remember this when giving your bid to the client. Gino will give you a cut list after the scale rendering is completed. This cut list is your ordering list. 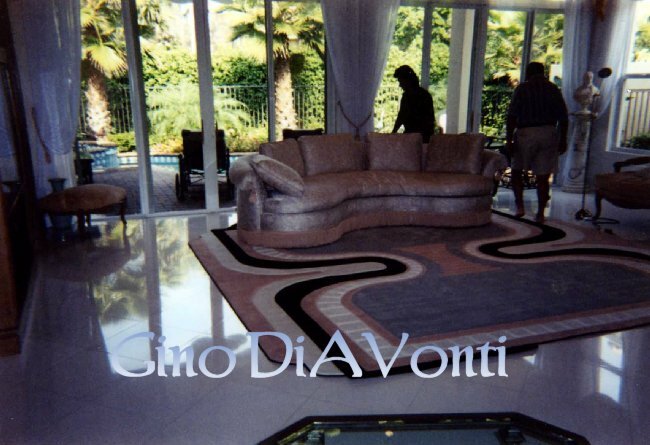 You are in charge of buying and ordering the carpet and having it drop shipped to Gino. Be sure to include the carpet in the price given to your client. After measurements are gleaned, Gino will be able to give you a rough estimate of the carpet footage needed beforehand so you will be able to give a proper bid to your client in a prompt manner. Gino is a real stickler on the carpet he uses to create his rugs. Only two companies are useable for the assembly and carving of sculpted area rugs. Those companies that qualify are Fabrica and Masland. He refuses to work in most lines made by Karastan, not because of it&apos;s quality, but because the carpet has what is called 'memory' and it does not lend itself to the fabrication of area rugs well. A definite 'no go' in the world of custom area rugs. Gino can take other woolen rugs and oriental styles and alter them if needed. The picture shown here is a wool center with a black Fabrica Chez border. He will also work in Masland and Fabrica berbers, knuckles and knots. This gives you the 'textured look', so desired today. A great textured carpet to order from is Masland's Reggae line. Area rug Carpet companies across the world typically use a cheap, see-through polyester binding to enclose the exposed, raw edge of a finished area rug. Gino hates the look of this binding, and therefore refuses to use it. Instead, Gino makes his own binding using an industrial sewing machine. Instead of polyester, Gino uses dense, heavyweight fabrics, custom matching the edge of the area rugs in question. This gives him a larger choice in colors available, thus a better match for the edge of said area rug. Fabrics used include tapestry weights, suedes, sometimes other light leathers, and heavy vinyls if a waterproof edge is required, an example being if a rug is comissioned for a yacht. You can definietly tell the difference in Gino's choice of bindings and 'the other guy'. Top quality binding adds to the overall appearance and richness of the area rugs. Are Fabric borders something you desire? How about a sisal field? Gino can create either one of these popular styles for you and your client. Call him ahead of ordering the fabrics, as some take extra in order to make the corners match up perfectly. He will need to see an actual sized swatch of any fabric that has pattern to it. This allows for a perfect area rug everytime! 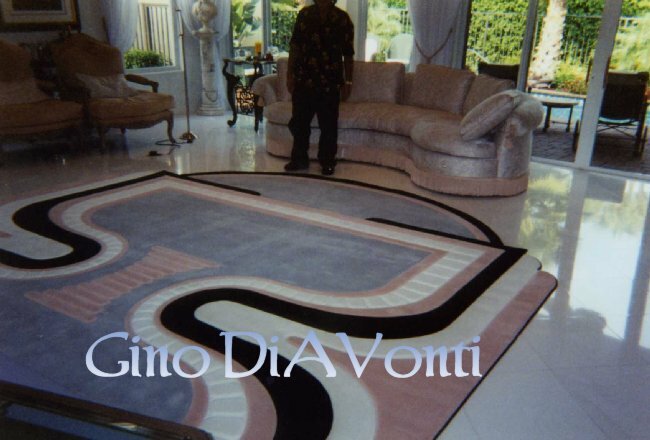 Gino is famous for the different inserts he has added to carpet over the years. They include linoleum, leather, fabrics, hides, glass baubles you can walk on, fiber optic light cables, and many others. The sky seems to be the limit, so don&apos;t be afraid to challenge him with your own new idea of an insert! Fiber optics make excellent inserts into rugs and give the more contemporary client and their home the option of having a custom designed area rug like no other. Thin cables are used for area rugs, and they are so tiny they can be stepped on even by bare feet with no pain. They have the distinct advantage of adding twinkling lights to the area rug in question, and are especially delightful when viewed in a dimly lit room or dutring evening hours. Think of the possibilities. Are you planning a Media room? What about a twinkling, multi-colored lit area rug to light one&apos;s path out of the room when viewing a movie? Random twinkling lights or patterns can be developed, it's your choice. Call or email Gino for pricing on custom designed fiber optic area rugs. If it&apos;s impossible for you and Gino to work together in person, don&apos;t let that stop you from booking a potential client! 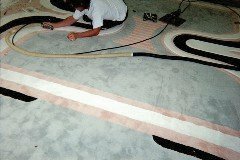 With the advent of the Internet, E-Mail, .jpeg and .png files, of course the phone, and overnight with FedEx; there is nothing stopping you and Gino from creating a set of custom designed area rugs that will be unique and original to your client. Gino can tell you in advance of you meeting with your client, what measurements are crucial to him in order to begin the renderings. You can E-mail Gino photo layouts of the room(s) in question, as well as detail of any architecture of wood carving he so draws upon to create the drawings. Colors of fabrics and other textures will also lay the initial ground work needed to do the renderings. The two of you can speak over the phone on exact color matches, through swatches and carpet lines useable for the job. Contact Gino&apos;s Representative Nichole today for more detailed information. Phone number is 239.895.7681 Call between 10:00 am and 6:00 pm please.